Our chemo-centric approach helps biopharma companies to fully understand the complete target profile of the compounds under development. Aiming to provide biopharma companies with new tools for drug discovery, Anaxomics has developed a chemo-centric approach to predict targets of a drug on the basis of chemical similarity. Structurally similar compounds are more likely to exhibit similar properties, which comprise physical, chemical and biological aspects. 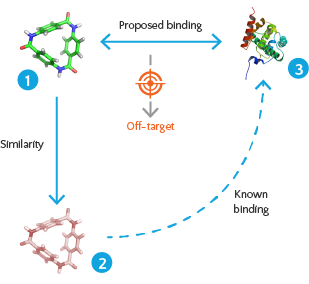 Accordingly, if a drug bears structural resemblance to another compound that has previously been studied, the targets of the latter will probably be also modulated by the former. Thus, when testing a lead compound against an entire data base of chemical structures, potential targets may be identified from various chemical analogues in the screening library. The higher the similarity between analogues is, the higher the probability that the identified proteins are real targets. By discovering new off-targets, a chemo-centric approach may be applied to characterize the safety profile of a drug or as an essential step of drug reprofiling. This method reaches its full potential when used together with a systems biology analysis as a part of a proprietary integrated solution developed by Anaxomics. You can read more about how we perform our chemo-centric approach on the corresponding White Paper.